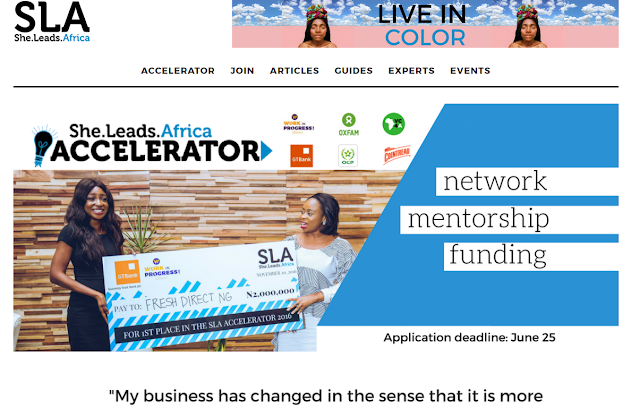 The SLA Accelerator is a 3 month program designed to identify, support and fund the next generation of Africa's brightest entrepreneurs. This year we're looking for entrepreneurs with businesses from the Agribusiness, Retail & E-Commerce, Technology, Creative and Beauty industries. - A chance to win N2 million in funding from SLA and much more benefits. This cohort is open to entrepreneurs building businesses in the Retail & E-Commerce industry in Abuja. This cohort is open to entrepreneurs building businesses in the Agribusiness industry in Kaduna. This cohort is open to entrepreneurs building businesses in the Creative industry in Lagos Island. This cohort is open to entrepreneurs building businesses in the Technology industry in Lagos Mainland. The Dark and Lovely x SLA Beauty Accelerator is open to beauty businesses in Nigeria, Ghana, Kenya, Ivory Coast and South Africa. Step 1: Put together a top-notch application package, ace the semi-final interviews and get selected by the SLA team. You can find tips and advice here. Step 2: Spend 1 week with the SLA team being trained in business skills and getting access to some of Africa’s top business minds. Step 3: Spend the next weeks implementing the lessons learned, meet with the other members of your cohort to learn together and watch the results roll in. You’ll have access to the SLA team for any help or guidance you may need. Step 4: Investor Dinner! Present your business to a room filled with investors and media. Previous SLA entrepreneurs have been featured on Forbes and CNN. They’ve gone on to raise almost $1mn. A lucky few even got to pitch to Aliko Dangote himself. Step 5: The top entrepreneur will walk away with cash money for their business. The others will have received 3 months of intensive support and may well hook a few investors in the process!